Get out of town with these interesting Fukuoka side-trips: Karato Sea Market (in Shimonoseki), Dazaifu (Dazaifu Temmangu, Tenkai Inari Shrine, & more) and Sasaguri-machi (Nanzoin & Komenoyama Obsevatory). There's lots more to do: have fun at Ohori Park, wander the streets of Mojiko Retro, browse the different shops at Tenjin Underground Shopping Center, and walk around Mt. Omine Nature Park. To find more things to do, traveler tips, and more tourist information, you can read our Fukuoka online trip maker . If you are flying in from Singapore, the closest major airport is Fukuoka Airport. In May, plan for daily highs up to 28°C, and evening lows to 18°C. Finish your sightseeing early on the 26th (Sun) so you can drive to Nagasaki. On the 27th (Mon), find something for the whole family at Huis Ten Bosch. Get ready for a full day of sightseeing on the next day: take in the awesome beauty at Mt. 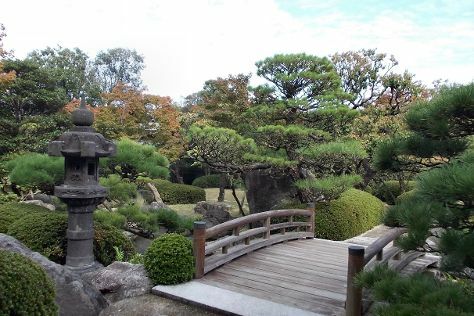 Inasa, stroll around Nagasaki Peace Park, then pause for some photo ops at Hypocenter of Atomic Bombing, then take an in-depth tour of Nagasaki Atomic Bomb Museum, and finally snap pictures at Megane Bridge. For other places to visit, where to stay, traveler tips, and more tourist information, you can read our Nagasaki tour itinerary maker app . You can drive from Fukuoka to Nagasaki in 2 hours. Alternatively, you can take a train; or take a bus. May in Nagasaki sees daily highs of 28°C and lows of 19°C at night. Wrap up your sightseeing by early afternoon on the 29th (Wed) to allow enough time to drive back home.